On An Overgrown Path: Does classical music really need an acceptable face? Does classical music really need an acceptable face? 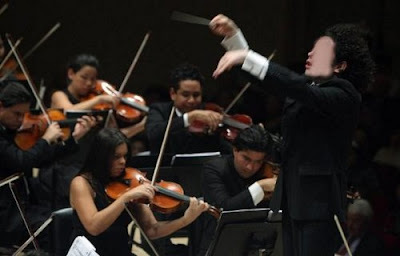 Speaking in defence of eye-watering salaries at top American orchestras a reader commented that star conductors earn that much because “someone is willing to pay”. Which is quite true, but begs the question of why orchestras are willing to pay such disproportionate and divisive remuneration levels when many other highly talented musicians face penury. The answer lies in classical music’s obsession with acceptable faces; which, in turn, is driven by the misconception that only celebrities can make classical music comprehensible to new audiences. This misconception is encapsulated, for example, in the industry’s obsession with a doubtless very talented but grossly over-exposed Gustavo Dudamel. As well as being viewed, wrongly, as open sesames to new audiences, acceptable faces are also seen as a way of winning favour with subscribers, sponsors and critics. And that explains why Levine, Tilson Thomas, Gilbert, Dutoit et al are paid small fortunes every year. A young man leaves home to understand classical music, and he travels all over the world and sits at the feet of many celebrities. But somehow classical music eludes him: he’s never quite able to get a hold of it. When he’s an old man, he returns home and opens the door, and there it is. Classical music was there all the time; it was just waiting to be discovered. As sort of a corollary to what you're saying, it seems to me all the focus on the big names is like gold plating the capstone of the pyramid while the rest of it crumbles - or building fancy home on a lake while the feeder streams are drying up. Amateur and small scale music making got whacked by recorded music, so the relationship of the big names to the whole is different. So I think your focus on animateurs, which looks to rebuild the crumbling parts of the pyramid and refresh the feeder streams is right on target. Your fable's premise is remarkably similar to the plot of Franz Schreker's opera Der Ferne Klang. Fritz searches the world for his elusive distant sound, only to discover upon his death bed that i the personage of Grete it had been in front of him all the time. Let's hope our search for the music ends a bit better. Odd that one of these link triggers a picture and story in which Bernstein is depicted as a hero. Surely it was his (or rather his ruthless Broadway talent agent's) haggling that drove conductor's salaries up and up and up. Gavin, the linked post does not depict Bernstein as "a hero". It depicts him, and I quote, "a true animateur if ever there was one". It is interesting how responses to posts like this always fall into one of two categories. One category expresses a view on contentious subjects such as the level of star conductor's salaries. Those responses invariably come from readers with no direct connection to the commercial-intermediary complex. The other category of response does not express a view, but is happy to snipe at those who do. Invariably these come from readers closer to the commercial-intermediary complex. Which is not surprising, as the power of the commercial-intermediary complex drives those outrageous salaries. Gavin, I would be interested to hear your views on the quoted salaries.